The current courthouse of Comal County, located on the NW corner of the Main Plaza intersection with Seguin Street, is a 3 ½ story building of Romanesque style that features rounded pavilion entrances and is constructed of native Texas stone. The architect of this magnificent building was James Riely Gordon. He designed numerous buildings including 72 Courthouses. Sixteen of these were erected throughout the state of Texas and 12 are still standing today. His Courthouse designs employed different colored building materials with columns, domes, and other interesting ornaments such as towers with clocks and bells. The contractors, Fischer and Lambie of Austin, used native limestone quarried 10 miles north of New Braunfels (known as the Altita Ranch on Hancock Road, which is now FM 306). Limestone rocks were taken from this quarry and brought to town by horse-pulled wagons. All of the limestone blocks were hand cut and the column capitals were hand carved. The last of this limestone rock was used in 1937 to build the spring-fed pool and bathhouse in Landa Park. Central Texas red granite was used for the columns and entrance steps. The entire original structure was fireproof, as it was constructed totally of stone, steel and steel-reinforced concrete – a relatively new building material in 1898. The courthouse reached a height of 83 feet and was originally 77 ½ feet wide by 92 feet long, with entrances located at each of the four corners of the building. The building design incorporated an open-air atrium which allowed light to enter the center of the structure and to facilitate natural ventilation by directing hot air to rise and vent through the tower. A rotunda supported the tower, centered over the metal roof of the building. A main staircase was located in the atrium for access to all three floors. Hand-laid encaustic tile floors were originally installed on all three levels. Encaustic tile incorporates different colored clays to create each tile. In 1897 the Commissioners Court noted in their minutes that a new courthouse must be built due to the dilapidation occurring to the current courthouse building. Many citizens voiced that the new courthouse should be erected on the public square. Judge Adolph Giesecke was chosen to request that Mayor C. A. Jahn convene the City Council on November 30th, 1897 in order to propose that the new courthouse be erected on the city-owned public square. Again, as was done 50 years prior, the response was negative. The city instead offered the County Commissioners two lots on the Comal River upon which to build the courthouse or to sell and use the money for the building. Other citizens offered free lots. There was, however, the matter of paying for the building as there was no available excess of funds. County government emerged in Texas in the early days of the Republic of Texas to bring order and public planning to promising settlements. Some of the first sites laid out in new settlements were public squares intended as the location of key civic buildings and the site for political speeches, auctions, and business transactions. The earliest permanent buildings to appear on public squares were courthouses. Courthouses represented organization, prosperity and, most importantly to the independent Texans, self-government. 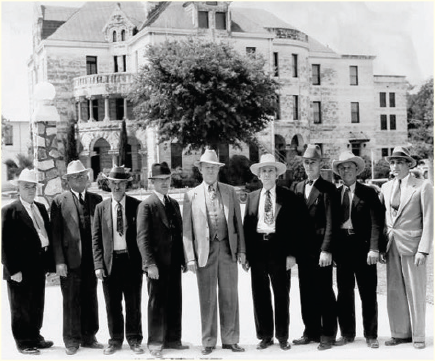 A new wave of Texas courthouse construction began in 1881, after the state legislature authorized counties to issue bonds to finance new courthouses. Five months later, Theodore Sterzing offered lot #85 with two small buildings for a total of $600; the court took him up on his proposition. On August 1, 1850, the county moved their records into the two small buildings. There was, however, no room for the district court and the commissioners again made a plea for funds to repair the buildings and to build a jail. Unfortunately, funds were not yet available. In 1855, the court named County Chief Justice James Ferguson, a Scotsman, and Commissioner Walder Andross, an Englishman, to ask the Texas legislature to enact a special law permitting the remittance of the Comal County state and ad valorem tax for the next four years to be used for the purpose of building a courthouse. This law passed by two-thirds vote of the Texas legislature, relinquishing the state tax for two years, 1856-57, and cited the County Treasurer to furnish bond in the amount of $9000 as the probable amount of state taxes coming to the county during the two years. The court approved selling $25.00 shares at 8% interest. In September of 1929, the Commissioners Court ordered county judge Carl Roeper to employ local architect Jeremiah Schmidt to draw up plans for a new district room and county jail to be attached to the main structure of the 1899 courthouse. Despite setbacks over bond issues, the court proceeded and on September 29, 1930, awarded the construction bid to A.C. Moeller of New Braunfels for $40,635. Rejecting the red brick of the planned addition, the commissioners once again went with the matching cut stone, at an additional cost of $6,075. In addition to the remodeling, the three-story jail had a jailer’s apartment on the first floor with a living room, kitchen, two bedrooms, a bath, and a separate outside entrance. On June 1, 1931, the jail was opened for public inspection, with a second and third floor to hold a maximum of 56 prisoners, including room for female prisoners, a padded cell for the insane, and an infirmary. In 1951, the Commissioners Court ordered another expansion of the courthouse with Jeremiah Schmidt once more drawing up the plans. The area was to be expanded by 930 square feet in addition to a new 1500 square-foot vault to be used for the office of the county clerk. The bid was awarded to Walter Sippel and Marcus Adams for $26,750. The next remodeling was in 1966 and consisted of the installation of an elevator, air-conditioning, renovation of the district courtroom, and rewiring and painting. The building contract was awarded to Edwin Hanz for $200,000. As the county increased in population, so did the county business. It became necessary to expand once again. E.P. Nowotny owned a building complex on Seguin St, next door to the courthouse. He sold the property to the county in 1963 for $56,450. This complex subsequently became the temporary annex. In 1998, while translating a newspaper article from the Neu Braunfelser Zeitung, a German translator named Dr. Robert Govier learned that county officials had buried a metal time capsule between the two ends of the cornerstone in 1898. This box was opened on the 100th anniversary of the dedication of the courthouse in 1999. Nearly 500 gathered to watch county officials unearth the time capsule, which was found to contain: news articles of the period, a photograph of President William McKinley, a copy of a Waco magazine called Brann’s Iconoclast, an invitation to a Skat tournament (a German card game) , a list of the men that built the courthouse, a list of city officials and city council members since the city’s incorporation, names of the school trustees and teachers, the principal’s most recent report, a copy of the school by-laws, a graduation diploma from the New Braunfels public school, two copies of city ordinances from May 1852 plus the revised ordinances, the statutes of the Mutual Fire Insurance as well as the statutes of the New Braunfels Mutual Aid Society, a short history of Comal County written by Hermann Seele, a sealed envelope from J.E. Nuhn, with a request that it be given to his descendants, two beer bottle labels used by the City Brewery, a copy of the Neu Braunfelser Zeitung of the same date, a copy of the Neu Braunfelser Zeitung carrying on its front page an artist’s sketch of the new Courthouse, the Neu Braunfelser Zeitung of May 19, 1898, an invitation to the ground-breaking ceremony, the Neu Braunfelser Zeitung Festival Edition of the Freie Presse Fuer Texas on its 25th Anniversary, various postage stamps, bank statements from the First National Bank showing $249,149.58 and school records showing the county’s first grade class of 23 boys and 24 girls. Some of the officials at the 100th anniversary were: County Commissioner Moe Schwab, Myra Lee Goff (served on research committee), Betty Triesch (served on the celebration planning committee), County Judge Danny Scheel, Mayor Jan Kennady, former County Judge Carter Casteel, and State Representative Jeff Wentworth. The Commissioners buried another time capsule to be unearthed in the year 2099. This capsule included: The County’s dedication (100th) as well as an invitation to the re-opening of the 111-year-old Faust Street Bridge. As was done 100 years ago, many of the committee members and celebrants retreated to the location on the corner of Castell Ave. and San Antonio St., then known as Gottlieb Overkamp’s Garden and now Callaghan’s Pub, for beer and lemonade. The Comal County courthouse is a nationally registered property and is a state archaeological landmark.